Not even in my wildest dreams could I have ever imagined that I’d have an opportunity to hunt quail over top notch English setters and English springer spaniels on a vast Florida plantation - let alone the unbelievable, once-in-a-lifetime adventure it became. 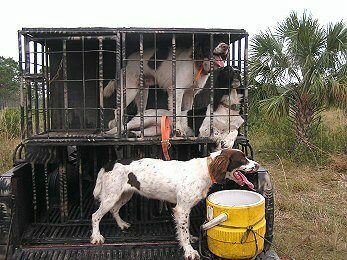 My whirlwind trip to Florida, at the start of January, came about through an invitation to quail hunt over the springer spaniels that I’ve sent to Capt. Dave Kreshpane over the past few years. Dave and his wife, Ellen, of Black Ghost Outfitting and Guide Service operating out of Jupiter Farms and the Keys are fly fishing and wing shooting specialists. They are also active in the local gun dog club, participating in AKC and UKC hunt tests and are known by their kennel name, Palmetto Point. 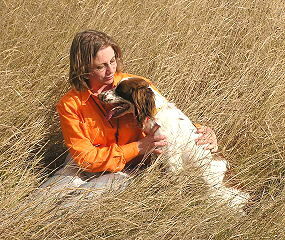 Kreshpane’s springers are truly awesome dogs - and Dave is an equally amazing gun dog trainer. 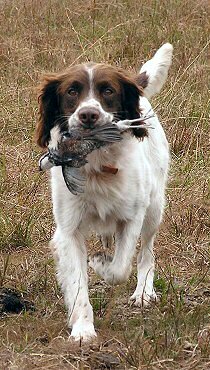 He expertly works the springers in tandem with setters: the setter points the quail, then he sends the springer in to flush and retrieve. Each dog knowing its job and remaining true to its purpose. The setter staunchly holding point even as the springer flushes the quail beneath his nose! It’s like nothing I’ve ever experienced before. It was a thrill watching the English setter quest for scent through fields dotted with cabbage palms, long-needle Florida pines, turkey oak, live oak, clumps of saw palmetto and gall berry shrubs as we followed along in an open buggy converted from an old jeep. Before long, the setter made game and locked up on a picture-perfect point. We got out of the buggy, loaded the shotguns, walked up with the springer at heel and got into position. 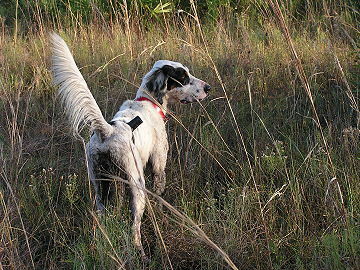 Then the guide sent the springer in to root out and flush the birds from the tangle of palmetto and gall berry shrubs. 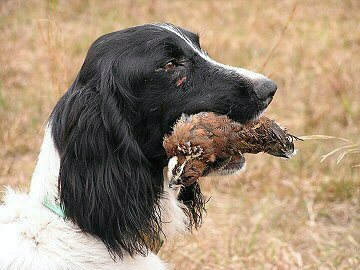 If the setter continued to indicate game, Kreshpane would ‘hup’ the springer until I had the shotgun reloaded and was ready for more action. The level of control and polish these dogs exhibited made hunting a real joy. On command, the springer fearlessly dove back into the thicket. The saw palmetto is punishing cover with razor sharp spines running along both sides of the stalks. Just lightly brushing against the palmetto, wearing heavy jeans, the sharpness is evident. As with hunting wild raspberry or rose brambles in the north, the dogs are so jazzed with the thrill of the hunt that they seem oblivious to the unavoidable cuts and scrapes. The quail hunt was great fun - and so different from hunting grouse or woodcock in the north. When flushed, the quail seem to fly about shoulder height and will quickly disappear into neighboring clumps of cover. It makes for some fast-paced shooting. I was pleased that I managed to connect with thirteen of the little rockets on the my first time out. Dave Kreshpane uses a no pressure method for developing his gun dogs. He is a firm believer in allowing it time to be a pup and it is given the opportunity to discover its natural hunting instincts - aided by an ample supply of birds. "You need lots of birds to make a bird dog," Dave says. He understands the mind of the young dog and how to tailor each dog’s training program so that it enables them to realize their full potential. After the morning’s hunt, it was back to the lodge for a delicious and hearty family-style lunch of salad, fresh tomatoes, eland meatloaf, boiled potatoes, gravy, green beans and chocolate cake with iced tea. Relaxing in rocking chairs on the large, shady front porch, the guests enjoyed the gracious Southern hospitality of our hosts, the J & R Outfitters and Game Reserve owners, Joe and Liz O’Bannon. Joe is a native Floridian, who has always lived life with gusto. He started out as a rodeo cowboy before venturing off to Africa in the 1980s where he discovered the thrill of big game hunting. As a professional hunter, O'Bannon continues to take annual hunting expeditions to the dark continent guiding clients in pursuit of elephants, rhinoceros, lions and exotic game. His safari stories are spellbinding and bring to life the ambiance of the lodge’s exotic game décor. 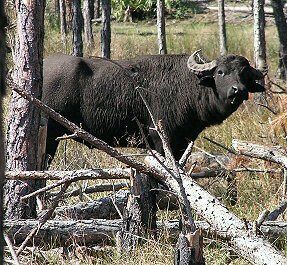 Renown for their herd of trophy Asian water buffalo bulls, numbering in excess of 150 head in addition to quail, hogs, gators and a variety of exotic game species, J & R Outfitters is situated on an expansive 4,000+ acres of pastoral Florida prairies, cabbage palm and oak hammocks - not far from sceenic Lake Okeechobee. J & R’s quail and habitat management programs are fine tuned from many years of experience which enable the coveys to thrive. The native black quail coupled with top rate pointing and flushing dogs - plus professional guide service - presents the wing shooter with an unrivaled hunt. About mid-afternoon, the buggies returned to the quail coverts. Four-wheeling along the trails, one enjoys an unrestricted view of a bounty of game species. In the area where Dave guided my afternoon hunt, groups of red deer stags and nilgai milled about - unconcerned with our hunting party or the setter quartering nearby. Over a delicious dinner of red deer that evening with the owners of the lodge, the topic of deer hunting came up - and I revealed that despite over a decade of deer hunting, I never had the opportunity to actually shoot one. Joe's reply was, "Well, we can fix that here!" The next morning, he offered me a chance to shoot a deer and brought me a 7mm rifle saying with a smile, "This rifle has killed more things than the plague." When Dave arrived to get ready for our quail hunt, Joe told him what was up and said to have me shoot the "biggest one I see". At about 11AM, following a couple hours of quail hunting and chasing off a curious water buffalo with some bird shot to the behind, we decided to go hunt a deer... an Axis deer. Native to India, they resemble whitetail with white spotted coats and beautiful, symetrical antlers. They are said to be some of the finest tasting game in the world. We found a small group of Axis with a couple of nice bucks, but I couldn't get a shot. The borrowed rifle was a left handed bolt model that didn't fit me at all. Shooting it as I would a right-handed rifle, it took me a few seconds too long to find a position where I could see through the scope. So, we continued searching. After chasing a lone water buffalo off the trail with our buggy, we spotted some red deer walking through a stand of pines. Dave said that often Axis will be found mingling with them. Sure enough, he was right. 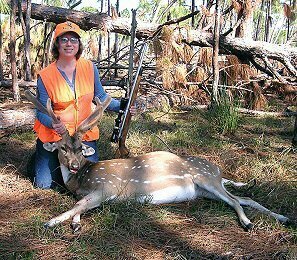 And what a fine looking buck - large bodied and in the velvet. I found my target through the scope, got ready to shoot, exhaled and gently squeezed the trigger - hand held. As I watched through the scope, I saw the deer crumple to the ground. We waited for a minute or two, then cautiously walked up to it. I had made a clean shot at the base of the neck and the bullet also broke the far shoulder. The excitement of the hunt hit me as I posed for the traditional successful hunt photo. What a rush! We brought the jeep around and loaded the animal onto the tailgate behind the dogs, heading back to the lodge for lunch. We capped it all off with one last quail hunt that afternoon. We got into some large coveys where the dog work was superb and the shooting, a challenge. It's easy to get caught up in watching the dogs and mesmerized by the beautiful sceenery. It is equally thrilling to carry a camera as it is the shotgun. 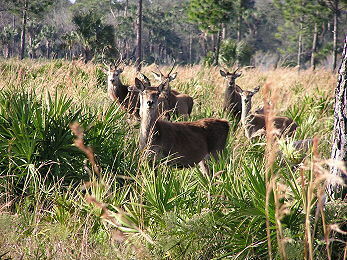 It was a Florida hunting adventure I’ll never forget.